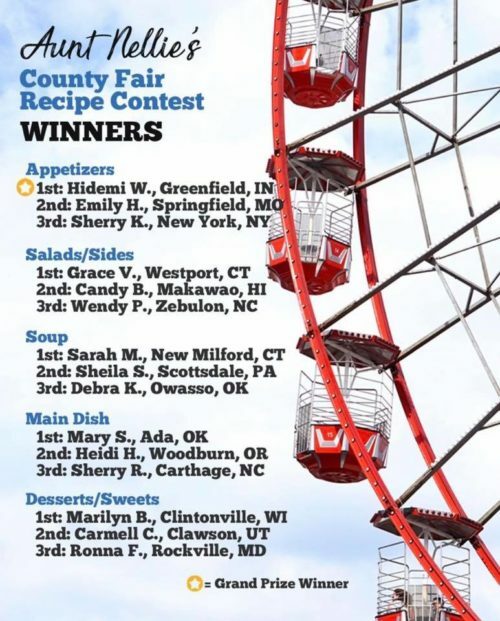 A few months back, friend Lisa Prince, who knows my passion for both entering and judging cooking contests, sent me a note about Aunt Nellie’s “State Fair” Cooking Contest. In case you don’t know, Aunt Nellie’s is a 90 year old company born in Wisconsin. Their products now include six varieties of glass-packed beets, onions, three bean salad, and red cabbage. Turns out, Aunt Nellie Jones (yep, there really was an Aunt Nellie) was a Home Economist like me… at the University of Wisconsin! And I didn’t realize until recently their first product was peas. The contest had 5 categories, and I spent a ton of time (not to mention money) creating, testing, styling and photographing a recipe for each category. Of course, I surely was hoping for something more, (don’t we all?!? ), but grateful for my 3rd place win in the “Sides and Salads” category. The prize was $25 and a box full of Aunt Nellie’s products. And I was very pleased with how this and all my recipes turned out. So maybe I will find other contests where I can tweak them and enter somewhere else since my entries are now the property of Aunt Nellie’s. That is the downside of most contests. Their fine print in rules usually states that entries become the property of the company where you entered… they can publish, use, and even change the name of it! BUT… for those of you that don’t know but may be interested, recipes cannot be copyrighted. Processes to make a recipe can be, as are head notes/descriptives, but the recipe itself… nope. Anybody can take anybody else’s recipe and call it their own! But there is usually a way I can make revisions to a recipe to turn it into something else. And like others, I sometimes get inspiration for a new recipe from another I run across. My goal is to always create something that hasn’t yet been done 1 or 100 ways. That can be challenging, but most ideas in my crazy head are unique. I don’t know I will do that (revamp) with my Aunt Nellie’s entries… but I did come up with a few mighty fine recipes and it would be a shame not to share some day! Appetizers, Salads/Sides, Soups, Main Dishes and Desserts/Sweets. So… one of these days, if I tweak my other entries, I’ll share those too. And since most contests prohibit entries that have been previously published, I’ll refrain from sharing them now in case I tweak to enter somewhere else. For now, I will enjoy this win as I’m sure there were hundreds, if not more, entries in the contest, and to be one of 15 is an accomplishment I’m tickled to enjoy! I “beet” out a many a fine cook for this honor and am excited to share with you… be sure not to miss my recipe down below. 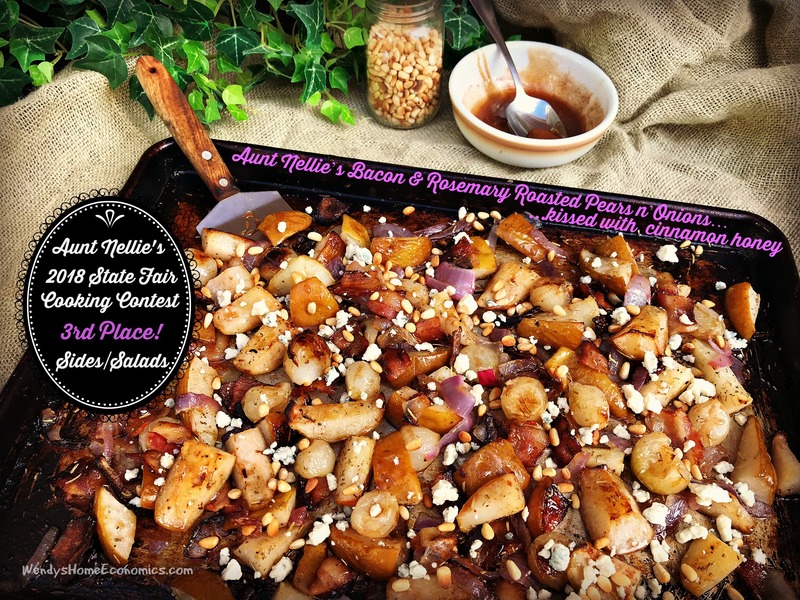 I do hope you will pick up some Aunt Nellie’s Onions and make this really easy recipe and if you do, come over to my facebook community and tell me all about it! We all love tasty speedy side dishes and this one can be thrown together in the time it takes to preheat your oven. This rustic sweet and savory combo is perfect alongside roasted meats. Roast a pork tenderloin at the same time for a complete supper. Or, turn it into a warm wilted salad by drizzling in a bit of balsamic vinegar when done and while hot, tossing with a big bowl of fresh spinach. No matter how you serve it, it’s sure to please… especially when BACON is involved! Preheat oven to 425. Scatter pieces of bacon on large roasting pan and place in oven while preheating. Prepare pears and red onion and place into large mixing bowl. Stir in drained onions and rosemary. Once oven has heated and bacon fat has started rendering, remove and pour bacon and drippings over pear mixture. Toss to coat well. Spread out onto hot pan and roast for about 30 minutes, tossing every 10 minutes, until onions and pears are caramelized and bacon is cooked. Once this roasted goodness is removed from the oven, drizzle with the cinnamon honey. Scatter with toasted pine nuts and blue cheese. Serve immediately. 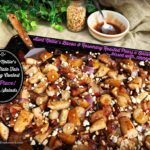 For a rustic salad, while warm, toss the pear and onion mixture into a big bowl of fresh spinach to “wilt,” drizzle with the cinnamon honey and some great balsamic vinegar. Scatter with the pine nuts and blue cheese. Also great alongside roasted chicken, turkey, pork or grilled steaks!